Vail Resorts and nonprofit Rocky Mountain Wild came to a compromise over concerns the Peak 6 expansion project at Breckenridge Ski Resort would damage the local Canada lynx population. Denver-based Rocky Mountain Wild issued a notice of its intention to sue over the Peak 6 expansion after finding the project would impact an area found to be a lynx transportation corridor, said Matt Sandler, staff attorney at Rocky Mountain Wild. The organization decided not to move forward with litigation when Vail Resorts agreed to increase its contribution to the National Forest Fund, which was established to address lynx habitat improvements in Summit County. The company agreed to pay $425,000 toward lynx conservation in Summit County. That represents $125,000 on top of its original pledge. Lynx are thought to have disappeared from Colorado in the early 1970s. An ambitious program in 1999 reintroduced the large, bob-tailed cat in mountainous areas of the state, according to Colorado Parks and Wildlife. By 2005, Lynx were expanding throughout the High Country. “We have moved into the lynx habitat and we need to learn to coexist in a way that won’t push them to extinction,” Sandler said. 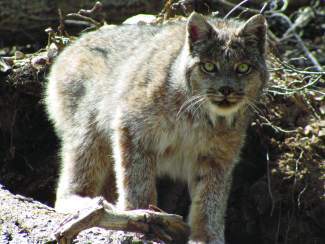 Funds provided by Vail Resorts will be put toward projects to preserve chunks of undisturbed lynx habitat, as well as road decommissioning projects, Sandler said. “We believe that this increased funding for lynx conservation in Summit County will benefit the species more than fighting to protect an area already affected by an adjacent ski area and other unrelated development,” said Tehri Parker, executive director of Rocky Mountain Wild, in a news release. In the agreement, Breckenridge ski resorts also confirmed they would not be expanding further to the north, and would limit any future permanent restaurant structure on Peak 6 below the tree line. They also said they would advocate with the Forest Service to limit backcountry access points that would have impacts on lynx. “Our Peak 6 terrain improvements have generated healthy dialogue resulting in a strengthening of our partnerships with conservation groups that will allow us to collaboratively support even greater lynx- specific efforts in the county,” Pat Campbell, the senior vice president and chief operations officer of Breckenridge Ski Resort said in a prepared statement. Breckenridge Ski Resort will continue development of the Peak 6 project throughout the spring and summer with plans to open the new terrain for the 2013-14 ski season.